Sipping water throughout the day keeps your body hydrated without consuming calories or sugar, but you might not favor the bland taste of water after a few glasses. Instead of switching to a flavored beverage, make your own by squeezing a wedge of fresh lime juice into your glass. Doing so provides a flavorful beverage that won't harm your health. A simple benefit of drinking water with lime juice is that it won't increase your caloric intake by more than a few calories. Soft drinks and fruit juice can contain hundreds of calories, but water is devoid of calories, and the juice from a quarter of a lime has just 3 calories. 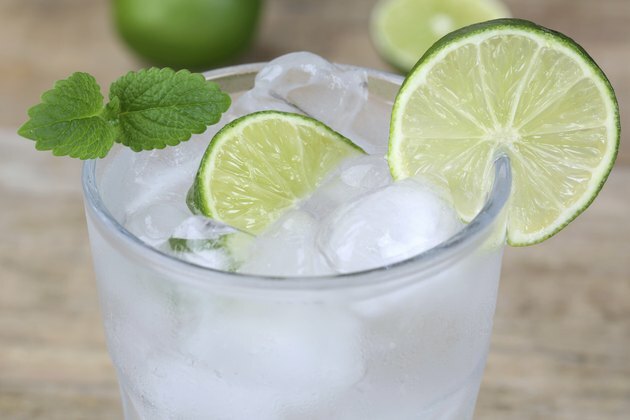 If you're trying to lose weight or just generally monitoring your caloric intake to avoid weight gain, water with lime is an ideal beverage choice. The average American should drink anywhere between 2.7 liters and 3.7 liters of water per day, depending on gender, but as much as 75 percent of the population is dehydrated, according to Idaho State Family Planning. Drinking water with lime can provide flavor appetizing enough to help you drink the recommended amount of water. Proper hydration can decrease your risk of cancer, promote healthy functioning of your kidneys, keep your muscles toned and aid in healthy bowel movements. Diabetics must be careful about the beverages in their diet, and water with lime juice is a healthy choice. The American Diabetes Association recommends adding lime juice to your water to provide a refreshing drink that won't affect your blood sugar. Other safe drinks for diabetics, such as coffee and diet soda, can have negative side effects. The caffeine in coffee can result in anxiety and poor-quality sleep, while the frequent consumption of diet soda can lead to a variety of health complications, including weight gain and a heightened risk of diabetes. Limes are a healthy source of vitamin C, and while the juice from a quarter of a lime only has 3.3 milligrams of vitamin C, making a habit of drinking water with lime juice can boost your daily intake of this important vitamin. Adults should get between 75 and 90 milligrams of vitamin C per day; several glasses of water with lime juice can provide a significant percentage of this guideline. According to the National Institutes of Health, a regular intake of vitamin C might lessen your risk of cancer.